BEST KNOWN FOR: Traditional celebration to represent the Epiphany - The finding of Baby Jesus by the 3 Wisemen... and of course, whoever finds KC becomes the king or queen for the day, thus providing a Manny Randazzo King Cake for the next celebration or get-together... HOORAY! FAVORITE MOVIE: Toy Story 1, 2 & 3. Although rigid, KC enjoys being seen at the local events and having fun. At a carnival parade, in front the Superdome, down by Jackson Square by the St. Louis Cathedral, KC is spotted checking out the tourists and visitors. KC and the siblings love to Second Line any chance they get. Mischief is KC's middle name because he's always getting into things such as playing hide and seek under the king cake, jumping into a bowl of icing, throwing dough pieces at employees and sprinkling sugar over everything as if it was fairy dust. KC knew Manny ever since Manny was a little boy growing up in "Da Parish" (AKA Chalmette, Louisiana) playing in the Family Bakery. Manny soon was putting KC in each king cake, hidden in a spot that only could be found by slicing and eating each piece of the king cake. 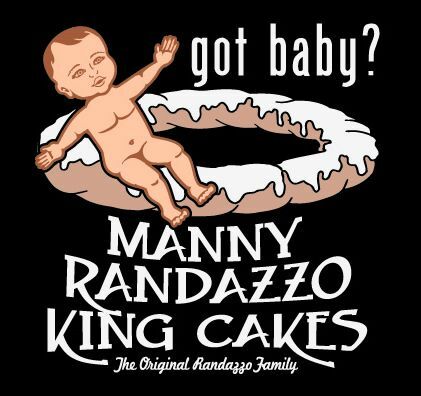 After Manny learned each and every facet of the Family Business, especially the Secret Formula for making the delicious king cakes, KC then only wanted to be in a Manny Randazzo King Cake. 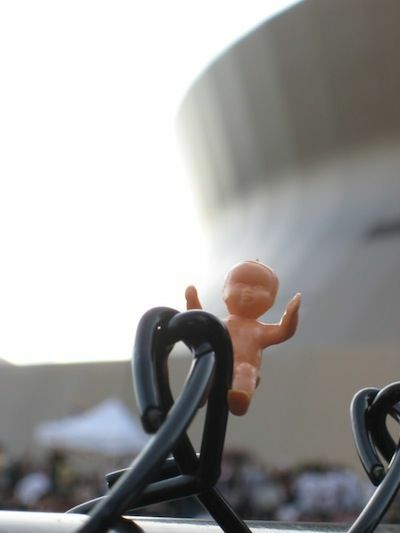 The bond grew and KC became the exclusive baby to go in all of his king cakes. KC enjoys laying around by the River on the Moon Walk, being in the pocket of someone going through the D-Day Museum, going on a Horse and Buggy ride through the Quarter, riding a street car down St. Charles Avenue, or taking a swamp tour down the Bayou. If you're downtown, you may just see KC around all the "hot spots" in the City. But the sure way to see KC is to buy a Manny Randazzo King Cake with its main location in Metairie, behind Lakeside Shopping Center and Transcontinental of North Hullen, or its outlet in LaPlace at 502 Belle Terre Boulevard. You'll see him hugging the bottom of a king cake slice, ready to hear the words "I GOT THE BABY!!" He knows once he hears that, then you're the king or queen for the day. Of course you'll have to provide the next king cake for your office or family gathering, that way KC will once again hear those words shouted by someone else. Be a KC fan and take him anywhere you go. Take a picture of KC at your favorite place or doing your favorite thing and we'll post them on KC's web page. KC was brought over to the New Orleans Zoo. He was so excited to see all the animals. It was a fantastic day and all the animals were out playing. KC saw the Tigers and remembered that he saw Manny make a Tiger Tail king cake. He tried to slip out of the pocket to get closer to the tiger tail, but he couldn't quite get out the pocket. Next KC saw the Elephants and watched as they did their tricks. The giraffes were quite astounding, because he's never seen anything like that with such a long neck before. KC then wanted to swim with the sea lions because they were so playful. He remembers jumping in a big bowl of white king cake icing and then remembers getting a bath to clean up from the icing. He was having fun swimming around. His day ended with eating some Roman Candy and watching the monkeys. Their playfulness sparked memories with KC's sisters and brothers all playing together in the bucket like a "barrel of monkeys". Sometimes when a worker tries to grab KC to put him in a king cake, KC's sisters and brothers grab on and wouldn't let go. The worker has to separate KC from the rest and then tosses them back in the bucket.